I am a Biology major at UCSC finishing up my last quarter. I am currently working as a veterinary technician at The Animal Hospital of Soquel, as well as assisting Vikram in his research and also tending to the animals in the ELVer lab. After completing my degree at UCSC, I plan to volunteer at various places and eventually apply to vet school. 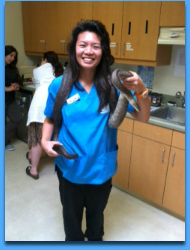 I am hoping to pursue a veterinary career while also being involved in animal research (thanks to ELVer! ).